The home of English football, in 1966 Wembley Stadium in north-west London played host to the FIFA World Cup and witnessed England win the coveted cup. Led out onto the ground by Bobby Moore, the English team, under manager Alf Ramsey, were locked in a 2-2 draw with West Germany when the game went into extra time. English player Geoff Hurst, who had already scored a goal, went on to score two more goals (one of which was particularly controversial with some still believing it didn’t cross the goal-line), giving him a hat-trick of goals and handing England the cup in a 4-2 win. The team received the Jules Rimet trophy (named for former FIFA president Jules Rimet and replaced with the current FIFA World Cup Trophy in the 1970s) from Queen Elizabeth II. While the history of Wembley goes back to 1923 when the Empire Stadium, referred to as the “Twin Towers” thanks to its distinctive two domed towers, was built on the site, the current stadium was only officially opened in 2007. Capable of seating 90,000, it is the second largest stadium in Europe. As the Empire Stadium, the ground – originally built for a British Empire Exhibition – had played host to events including the 1934 Empire Games, the 1948 Olympics, and numerous football finals including the so-called “White Horse final” when a mounted policeman went on the pitch to contain the estimated 200,000 fans who watched the Bolton Wanderers FC defeat West Ham United FC 2-0 in the 1923 FA Cup final. 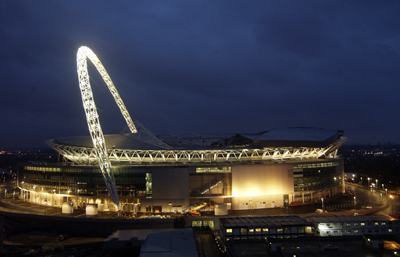 The current stadium with its iconic arch now plays host to the FA Cup as well as other high-profile matches like the FA Community Shield and large events including rock concerts (a recent vote on the Wembley website found that the greatest event ever held there was a 2007 concert by Muse). This Olympics, Wembley is hosting numerous football matches including the gold medal match for both men and women, on the 11th and 9th August respectively (the last time the men’s final was played here during an Olympics was in 1948 when England won the bronze). It’s hoped a new record will be set for the number of people attending a women’s Olympic football match (the current record of 76,489 was recorded at the 1996 Olympics in Georgia at the Stanford Stadium) during the Games. With a one kilometre circumference, the stadium encloses some four million square metres (equivalent apparently to the space taken up by 25,000 London double-decker buses) and features a Royal Box in the middle of the north stand from where all trophies are presented. The roof is partly closable. There are tours of the stadium (although it’s closed during the Olympics), details of which are below. WHERE: Wembley National Stadium, Wembley (nearest Tube stations are Wembley Park and Wembley Central or the Wembley Stadium British Rail station); WHEN: Selected dates – see website for details; advance booking strongly recommended (the stadium is closed for events, including the Olympics and before and after); COST: £16 an adult/£9 a child (under 16, under five’s free)/£9 seniors/£41 family ticket (zip wire ride extra); WEBSITE: www.wembleystadium.com/Wembley-Tours.aspx. PICTURE: Action Images/Paul Harding (courtesy of Wembley National Stadium).